This tutorial shows how to install Light Table IDE in Ubuntu 13.10, Ubuntu 13.04,12.10, 12.04 and manually create launcher for Unity Desktop. As you may know, Light Table is a new interactive IDE that lets you modify running programs and embed anything from websites to games. It provides the real time feedback we need to not only answer questions about our code, but to understand how our programs really work. 2.) For global use, extract the download package and put the result folder to /opt/. I could not get this guide to work. On a clean Ubuntu 13.10 VM, I can’t get nautilus to run. On several fresh attempts, I get a message that a display cannot be opened. I tried both of your ‘sudo’ lines of code, and set the display to 0:0.0 but, this didn’t help so I can’t try the rest of the solution. You mean you can’t open the Nautilus as root? Well, launch a terminal via Ctrl+ALt+T and type in sudo nautilus, hit enter and input password. Does this brings up your browser? In case it’s important, I don’t find that any of the Ctrl codes you mention do anything when I’m using Ubuntu. (nautilus:1361): Gtk-WARNING **: cannot open display. The actual error code may not be the original one, as I have tried a solution or two. 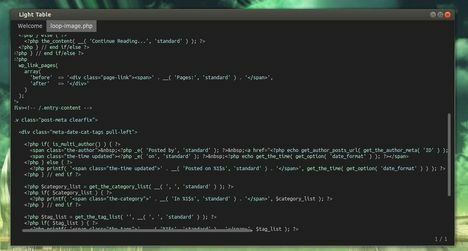 In 13.10 i had to add env UBUNTU_MENUPROXY=0 /opt/LightTable/LightTable as the command to the launcher. Otherwise the menus were grayed out and non responsive. Can I translate into Korean this article? Thank you, worked out for Ubuntu 14.04. /opt/LightTable/LightTablelibudev.so.0 or libudev.so.1 not found in any of /lib64 /lib/x86_64-linux-gnu /usr/lib/x86_64-linux-gnu /usr/lib64 /usr/lib /lib. Thanks for the tutorial. Just one question, while I was trying to figure out how to put the icon I created three launchers, two with blank images, and the good one. Do you know how I can remove the other two? Launcher files are located in /usr/share/applications. 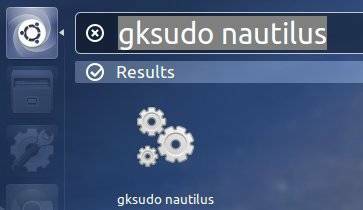 In terminal run gksudo nautilus to launch nautilus file manager with root privilege. Then navigate to computer -> /usr/share/applications, find out the wrong icon files your created and remove them. Thanks! works perfect in trusty!! Thank you very much, I read another tutorial but I couldn’t made it work. thank you so much. works on gnome-ubuntu 14.04 without issues. Worked perfectly on Ubuntu 14.04. Thank you! Thanks for this guide!! It has worked for me!! You rock! Works perfectly on Ubuntu 15.04. Thank you so much!